Minstrel Court features listed buildings overlooking a private lake not far from Bassignbourne Barracks in Cambridgeshire. The ceremony takes place a short walk from the main buildings under a beautiful wooden pavilion overlooking the lake. When I arrived there was an eery silence far from the usual hustle and bustle of a wedding venue on the morning of the ceremony. I managed to find the Bride, Laura, sequestered in a room beyond the bar and dance area. The room was narrow and a little crowded due to the numbers in the bridal party. It wasn't long before the Groom, Dany arrived along with his party. Guests arrived as the first drops fell. By about 1pm once all the guests had arrived, we made our way slowly up to the Lake Pavillion whilst dark clouds loomed. 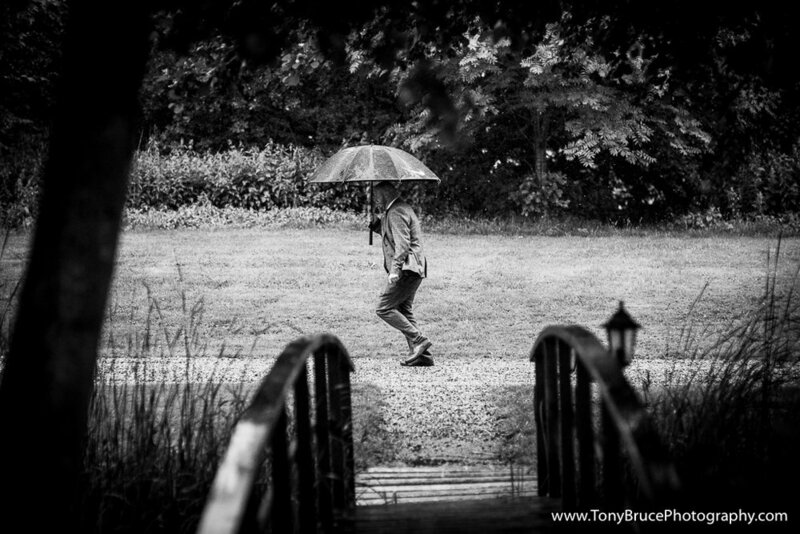 Rain, at a wedding, is often a bride's worst nightmare but for me I quite like it as you can get some very unique shots. Whilst we waited for Laura to make her way up from the main house the heavens opened on a biblical scale. It was originally planned that Laura and the Bridal party make their way on foot from the house to the Lake Pavillion but that quickly changed. One of the groomsmen ran to his car and headed down to collect Laura and the bride's maids. One of the groomsman dashes for his car in order to collect the Bride and her party as the heavens opened. The Bride is protected from the driving rain. Once under the protection of the Summer Pavilion it was smiles all round. Umbrellas were shaken off and folded away. Laura took her father's arm before heading down the aisle. From a technical point of view, the only problems I encountered were switching settings quickly from the light outside of the pavilion to relatively gloomy light under the shelter. As Laura glided down the aisle a huge smile spread across Dany's face. 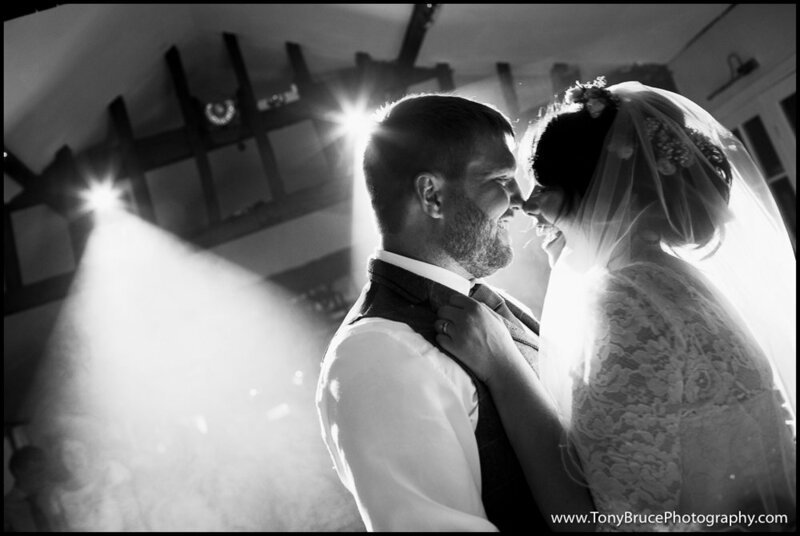 There were plenty of laughs and cries as the vows were exchanged and the rain pattered down on the wooden roof. I loved the use of a disused shot gun cartridges as a button holes. The younger guests were as good as gold waiting for the arrival of the bride. Safe at last. Bride's maids straighten Laura's dress whilst dad mops the rain from his face. The rain stopped almost as soon as the ceremony finished and it wasn't long before the sun was shining. The congregation then made there way (less hastily this time) down to the marquee for reception drinks. Back to the marquee for drinks! Once back at the marquee I waited until I felt that Laura and Dany had mingled with guests for a while before taking them off for 15 minutes to have some photos of just the two of them. Dany and Laura next to his beloved Defender. My first attempt at day time off camera flash really helped to even out the exposure. Check out the decor on the car! After the meal with everyone was full to bursting, one of my favourite parts of the wedding commenced; the speeches. Tributes were paid from father to daughter, groom to bride and so on. Dany paying tribute to his new wife. ...and Laura deservidly relishing the admiration from Dany. Ben - Dany's brother and best man looks on disapprovingly as Dany divulges some embarrassing childhood shenanigans. After the speeches guests mingled in the grounds whilst the children went off exploring. A bouncy castle was inflated much to the excitement of the children. I'm sure the adults were happy with this master stroke too as it bought them some more "quiet time". A short walk from the marquee is the main bar and dance room. It's a rectangular room with the bar at one end and the dance floor and DJ at the other. Just beyond the dance area is another room where tea and coffee making facilities are available. This area attracted the more elderly guests as it gave them a bit of peace from the music. I loved the light-up dance floor, it added a real 70's disco feel. At around 10pm guests were asked to make their way outside to enjoy a fireworks display. All in all, a day that looked like it was going to be a wash out, turned out to be one that would be enjoyed by everyone long into the night and will be remembered for a long time. Minstrel Court is a hidden gem and a wedding venue that I would highly recommend. For more information about Minstrel Court visit their website by clicking on the image below. The hunt for "The Lone Wolf"
It's simple. If you want to quit, ring the bell and take your arm band off. Competitors discovered their limitations in The Pit. I received a phone call from Si Weatherall a few months back. He explained that he was organizing an endurance event like no other. Myself and Si served together at 42 Commando, Royal Marines. 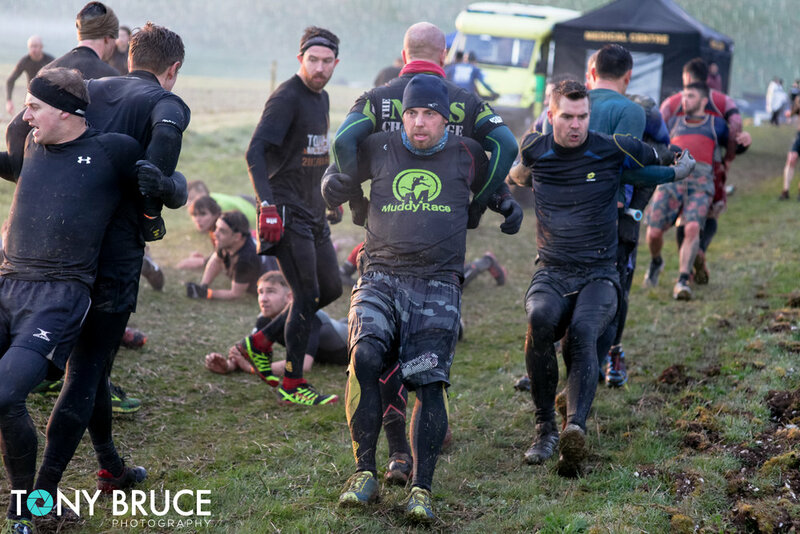 Si explained how the competitors would be put through a challenging, military style beasting with an 8 mile obstacle run thrown in for good measure. I was asked to be the lead photographer and so I couldn’t resist. The valley with the car park (top right) and the camping and admin areas in the foreground. Old parachutes were used for the shelters. I travelled down to Simon’s house in Hampshire from my home in Hertfordshire and arrived at around 10pm. I was expecting to see a house full of ex marines, sprawled in sleeping bags all over the place but when I went up to his house all the lights were out. I put a quick message out on the facebook messenger group and straight away “Coach Pain” said he was just around the corner and that he would come and let me in. He’d nipped out for a Kebab and explained that all the other guys were up at the farm where the Intrepid Series was being held adding the finishing touches. 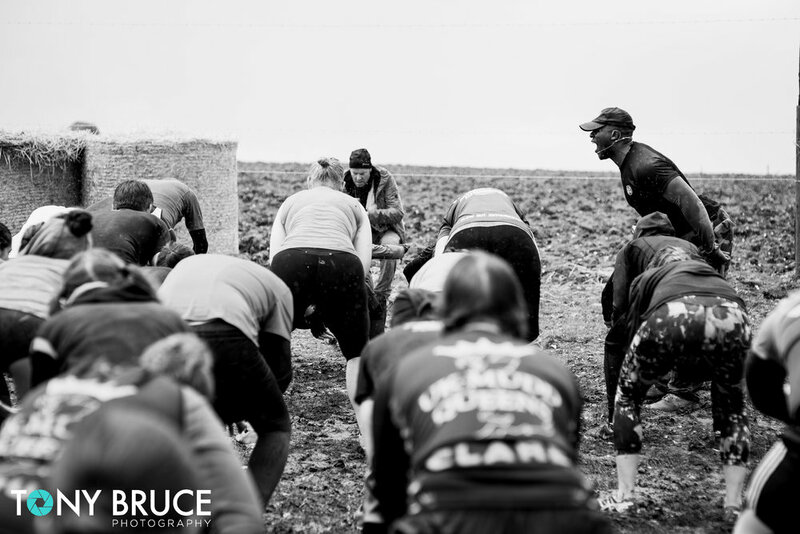 Coach Pain (as he likes to be known) had flown all the way over from Arizona to provide some motivational speeches for the competitors as well as put them through their paces using his own fitness methods. Si arrived back at the house at 12am and we didn’t get to sleep until 2am. The last sandbags being put in place. One of the Intrepid team take cover from the all too frequent down pours. Georgiana Robitu and Nicky Wilding set up camp before the rain came. At 6:00am the alarm went and we had breakfast and headed up to the farm to finish preparing the course. Competitors started arriving for the 4 mile fun run at around midday. I managed to chat to a few of the first arrivals and even helped a few set up their tents due to that fact that there were large rain clouds looming. It rained on and off all afternoon with sunny spells in between. Coach Pain kicked things off with a motivational brief outside The Pit before leading them in for the “fun” to begin. 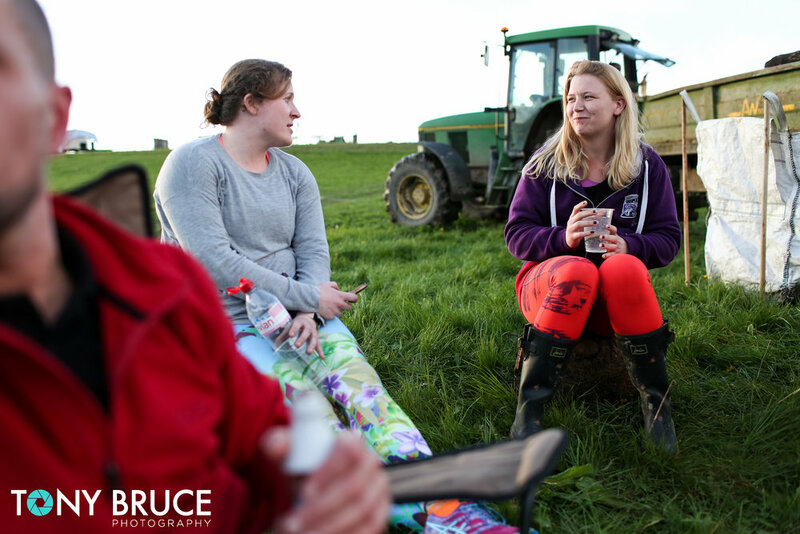 Some competitors having a brew after setting their tents up. One of the spectators and her dog taking shelter in one of the parachutes. Runners gather around the campfire moments before the fun run. The event itself was held in a valley on farm land normally used to graze cattle. At one side of the valley the competitors arrive and park before heading down a steep track to the camping and admin area. Up the other side of the valley The Pit looms ominously. The Pit was a square approx 50m square which looked like something out of a prisoner of war camp. Barbed wire lined the area and added a rather menacing touch. 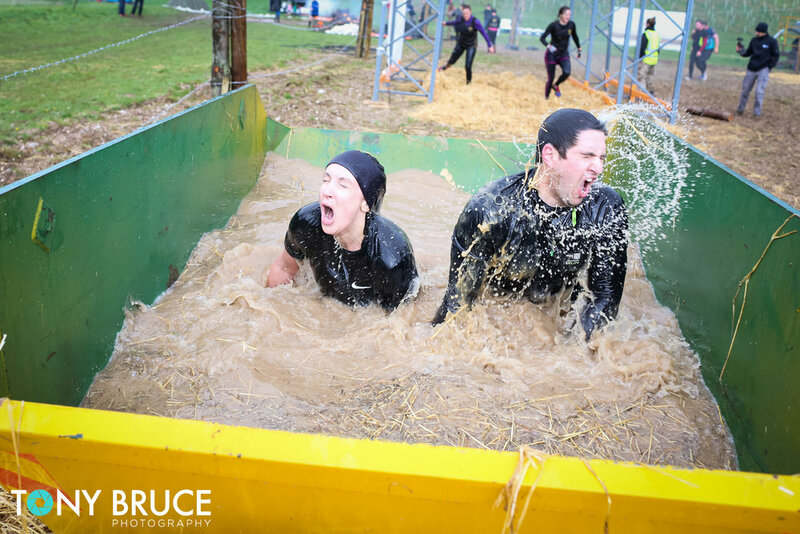 Within The Pit there was a skip filled with ice cold water, monkey bars and a kind of sheep dip which reminded me of the kind we had to submerge ourselves in during the Endurance Course on Woodbury Common back in ’99 as part of the commando tests. Simon Weatherall briefing the Intrepid Team before the fun run. Coach Pain from Arizona welcomes the competitors into The Pit and begins the warm up. After a good 30 minutes of a military style beasting from Coach Pain the competitors were asked to grab a sand bag between each pair and set off around the 4 mile course. 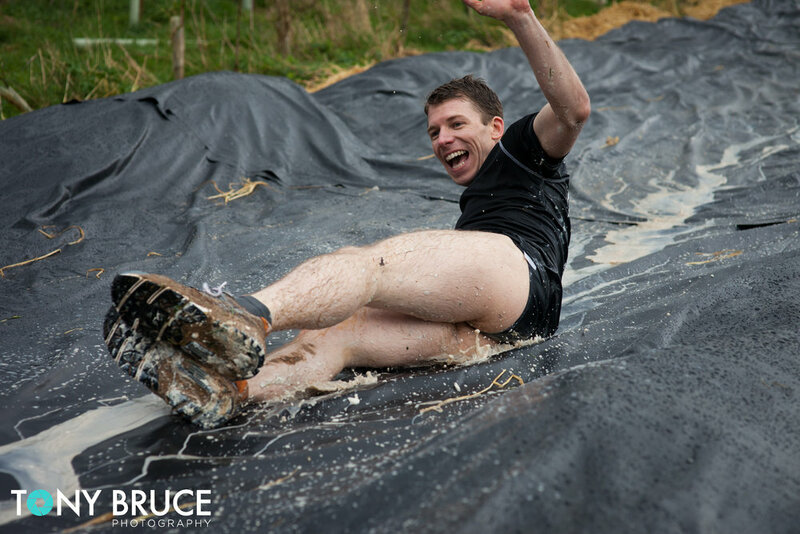 Along the way there were various obstacles and a 20 meter long water slide. 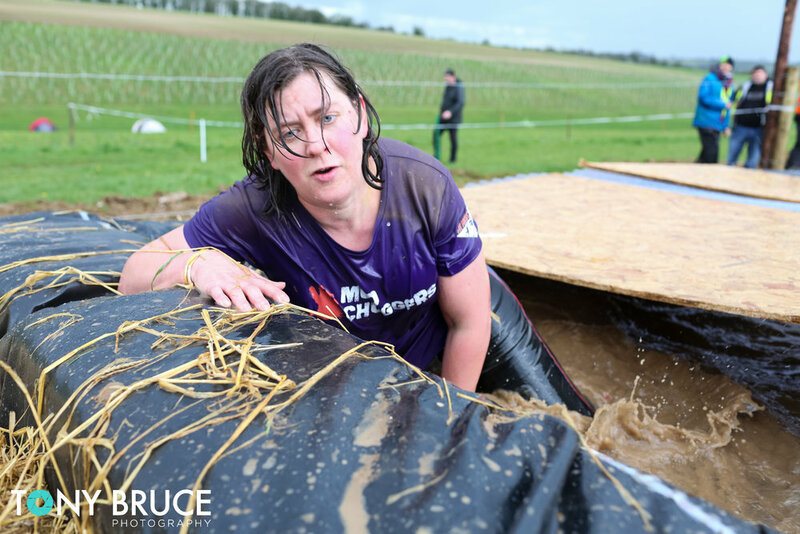 Once back at The Pit competitors make there way through the sheep dip, across the monkey bars and then through the skip. Once out of the skip, it’s high fives all round as that is the fun run over. As the runners came through they grabbed a quick photo with ex SAS veteran and co-event organizer, Rob Paxman and then headed down to the base of the valley for a shower and a change of clothes. Rob Paxman, former SAS soldier welcomes the competitors over the finish line. (Note: a wide angle lens was used to capture the gun show). 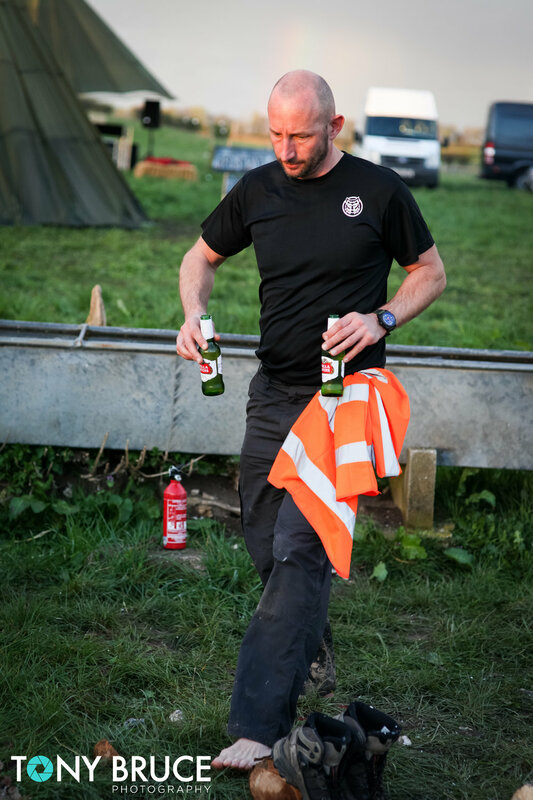 I joined the runners around the camp fire for a steak burger and a sneaky beer and watched as more people arrived for the main event. Amoung the new arrivals were guys from my very own fitness bootcamp, DCF (Detonate Commando Fitness). 6 of them were brave enough to take on the event. I spoke to a pair of lads that had come from Hull and another from as far as Glasgow! 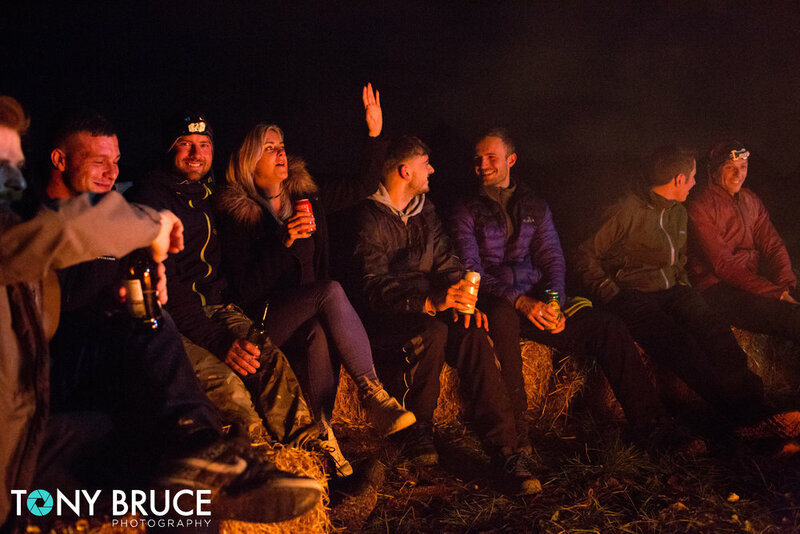 I unpacked my sleeping bag around the fire and managed to get a few hours sleep even though wolf cries were being blasted out over the DJ’s sound system for most of the night. I heard later that the wolf noises and rumors of getting “bumped” by the DS (directing staff) during the night kept most of the runners awake and on edge. I was rudely awakened by the sound of a fire extinguisher and panicked voices. When I managed to squeeze my head out from my bag I could see the beaming smile of Si Weatherall, extinguisher in hand. He said, “that was close”, as apparently most of the hay surrounding the fire had set alight. I managed another 10 minutes sleep before I had Si waving a torch in my face this time, “wakey wakey” was the greeting. I got up and it must’ve been about 3:00am. The place was buzzing. I could see head torches all around me coming and going. Competitors were still registering. In the foreground competitors gather round the camp fire for a motivational speech from Coach Pain. At the top of the image late comers' head torches can be seen as they wind their way down the valley. 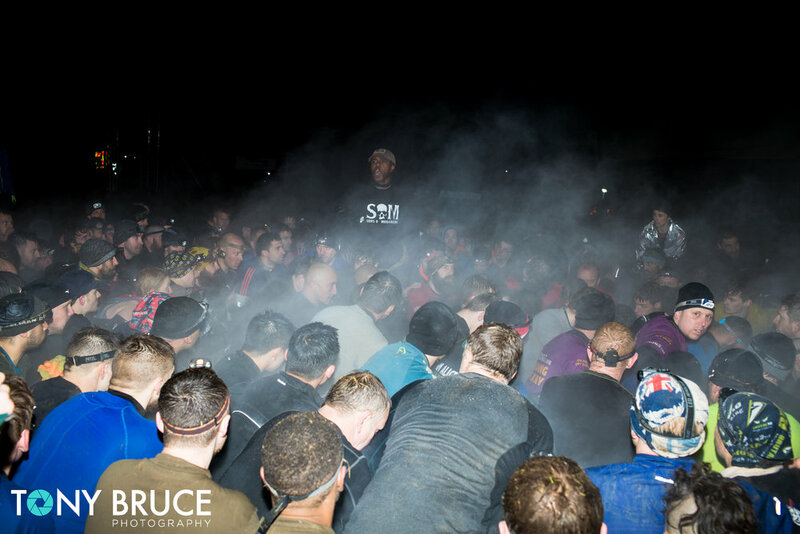 With the vast majority of the competitors around the camp fire Coach Pain gave a stirring speech under the illumination of head torches and the camp fire. At 0355hrs they made their way to The Pit where the DS were waiting and Si was stood on an over turned hay bail acting as a podium. Behind him the blues and twos of the medical team were flashing through the smoke coming from various oil drums dotted about. The scene looked quite daunting and I’m sure that the realization of what was about to come was sinking in for the runners now. They knew to expect a beasting and an 8 mile run thrown in somewhere. Si Weatherall radios to the guys on the gate to make sure everyone is in The Pit. Si went to speak and a funny remark came from the gathered crowd. He asked who ever it was to come forward with their partner. They were sent to the flank for some “correctional exercises” by DS Nigel John. The good humour that had lasted until now was firmly stamped out by Si. All head torches were now turned off and the only ones left on were that of the DS. While this correctional exercise was being conducted Si explained to everyone that all of the DS were to be addressed as “Staff” from this point onwards. Si closed his brief with the sentence “we are looking for one of you”. From the outset the whole Intrepid Series has been marketed with the slogan “Are you the lone Wolf”. The top 20 pairs from this event will get through to the next stage held in a few months time. For the next hour or so in the darkness the crowd were put through their paces which gave me flash backs of my Royal Marines training. When the competitors weren’t squatting they were running on the spot, arms held above their heads. Press up after press up, stress position after stress position time dragged on, all the while choking smoke billowing from the barrels wafted over The Pit. The DS were moving in and out of the crowd watching for anyone trying to get some respite or not working hard enough. One at a time, teams that were loafing were told to double straight over to the skip and to fully submerge themselves in the freezing, muddy water before rejoining the main group. If this wasn't enough, one of the DS was walking amongst the crowd spraying freezing cold water from a hose pipe. 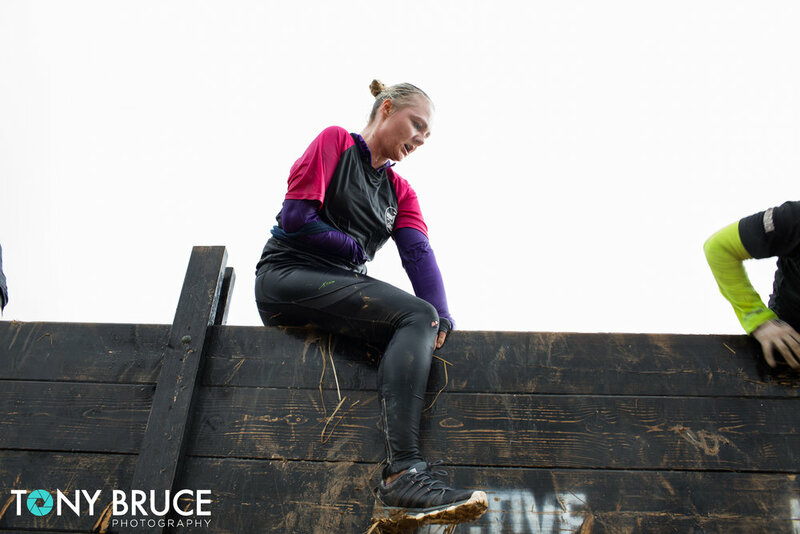 Obstacles such as this "fallen gate" were dotted around the course. Some chose sandbags to carry between their pairs, others chose logs. Both a pain in the arse. Upon registering the competitors were handed an arm band with the Intrepid Series Wolf logo on. This was to remain on at all times during the main event unless you decided to quit. At about 10 minutes in the bell rang for the first time signaling that the first pair had quit and left The Pit. Arm bands were removed and thrown into a waiting barrel. Sun rise and the pain continued. Numbers were dwindling by now. At first light a quick water stop was allowed before the runners lined up in pairs (a sand bag between two) expecting an 8 mile run. They set off -some at break neck speed- around the course. Once everyone was back in they were given the bad news. 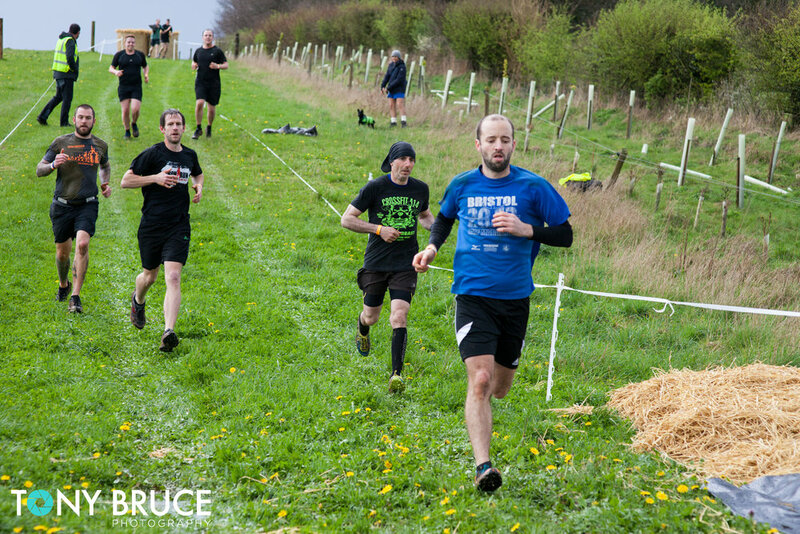 The 8 mile run was actually going to be split in 2 with the competitors having only completed half so far. I’m sure the front runners were regretting their decision to go all out at this point. The beastings continued well into day light with the bell ringing more frequently now. I even got a chance to provide a portion of the beastings using some of the methods that I practice at my own boot camp which I have to say I thoroughly enjoyed in a twisted way! After what probably seemed like a lifetime for the competitors they were gathered around the podium one last time. 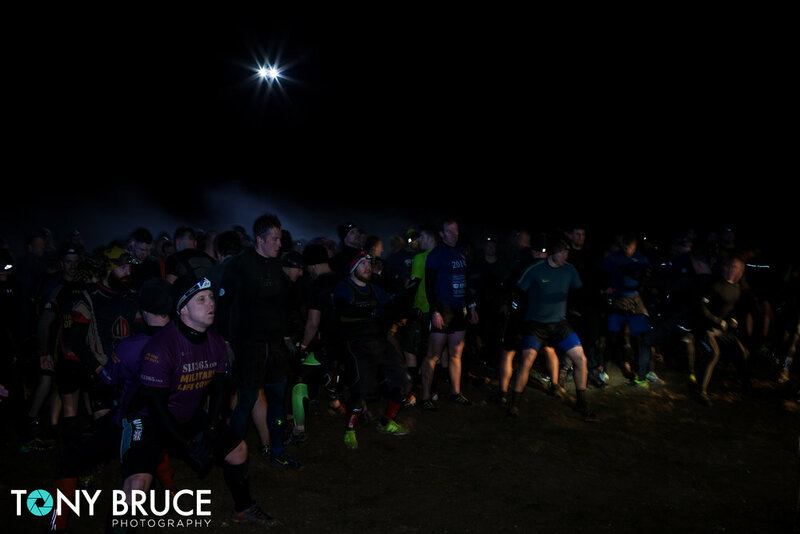 Si then explained that the 4 mile course would be run once more, only this time, the top 20 teams back would go through to the next stage. This time it was an all out effort. The first pair to arrive back from the final 4 mile run. A team show their appreciation for each other once it's all over. The final 20 teams that made it through to the next stage. 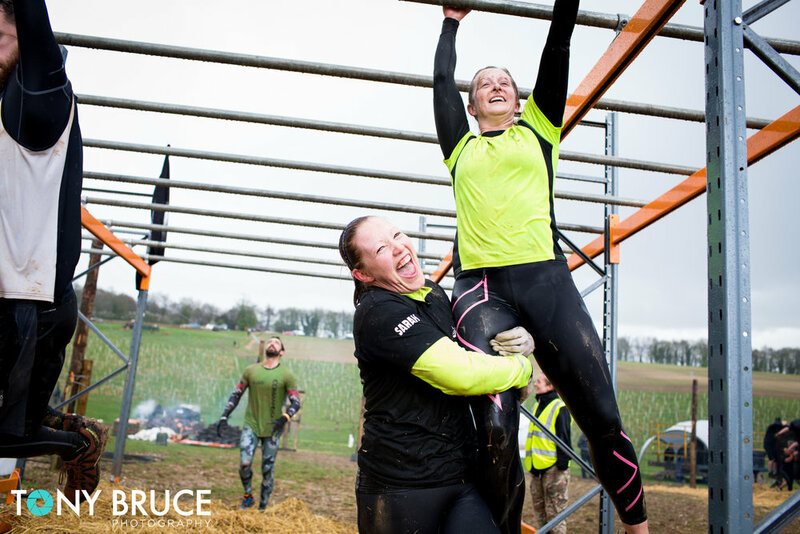 This was no OCR (Obstacle Course Race) but a test of an individuals will power and stamina. The Intrepid Series pushes people to their limits and beyond. The feed back that was received at the end was overwhelming. Some said it was the hardest thing that they have ever done. The over all consensus was that this event gave competitors an enormous sense of achievement. Even if they didn’t make the cut, simply to finish without ringing the bell is a great feat. I have the utmost respect for all competitors that finished the event. The DCF team pictured with myself. Lost but found - "Sea Sweat"
I was going through the archives and came across this image that I was lucky enough to have featured in Digital Camera Magazine. It is to this day one of my favourite shots. I took it whilst I was providing armed security on oil tankers. We were heading north on the Indian Ocean just past the northern tip of Madagascar carrying a cargo of iron ore from South America. It was unbearably hot and there wasn't a cloud in the sky. I was out on the starboard bridge wing on look out when I happened to look over the edge and saw this deck hand wandering around spanner in hand. I rushed back into the bridge and grabbed my camera. When I glanced over the diagonal shadows caught my attention first. It was a good job that I captured him when I did because just after I released the shutter he moved out of the scene. There are so many interesting things going on; the yellow circles, the iron ore scattered across the deck, the mast shadows, the oil tray. It just all works. Such an unusual perspective.